785.00 USD Note: Prices do not include tax. For Pre-Registered Pricing, please register 21 or more calendar days before workshop. 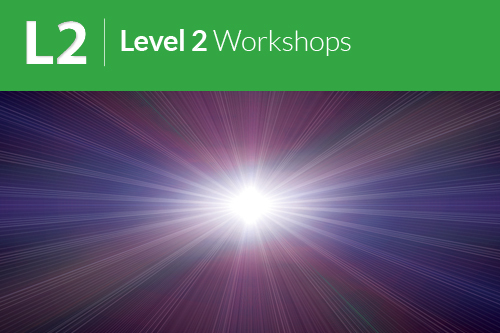 Learn Advanced Quantum Touch in 2 Days or this class can be taken as the culmination of a 5 Day Quantum Upgrade Retreat! This starts with learning to expand our Heart Field with Energy and Love and use this field directly to accelerate our work. These two days are full of techniques that can be used as Energy Upgrades to all parts of the Self. Use these Energy Upgrades for Yourself or anyone in the world! We embark on a journey of bringing about our dreams through energy. 1. We walk straight towards Pure Presence with expansive love energy and also through feeling. 2. Align the entire skeleton simultanously! 3. Upgrade many aspects of your mind and your ability to use energy by sending energy to spiritual glands and areas of the brain. 4. We learn to download and gather any energetic essence we want from our higher/ideal selves and the universe and deeply integrate those energy signatures into our energy field to achieve amazing almost instantaneous results in our lives! 5. From our ideal selves we integrate those essences into our own fundamental energy signature using the power of the 10th and 9th and 8th Chakras to turn Possibility into Probability by integrating the Energy of Our Desires into a 10 Chakra funnel. 6. Learn techniques to do energy work on large groups of people at once! 7. Create your own Macros to simplify complex healing or boost your Life Situations! Thank you for reading and looking forward to sharing this amazingly powerful and uplifting energy healing class with you!